Over the past few days, I have seen a few disturbing Facebook posts about Christian's slaughtered in Nigeria and the Philippines. Of course, as a Christian and, frankly as a human, I am deeply saddened by this. But, these posts have been rhetorically dishonest and so devalue and dishonor those who have died. The reports are not usually posted with a simple "this is sad, we should pray and remember Christians who live in hard places and have their lives taken from them." No, instead it's, "the media is falling all over themselves to report the massacre in New Zealand, but nary a word about the slaughter of Christians in Nigeria and the Philippines." It's a rhetorical trick attempting to demonstrate that the media ("the left wing media") doesn't care about the plight of Christians. Problem is, the facts are very wrong. 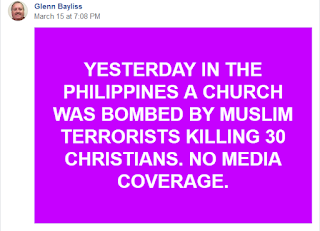 First, consider what is being spread regarding the bombing in the Philippines; the following post is an example. This was posted on March 15th, shortly after the New Zealand mosque killings. Indeed ISIS terrorists did attack two Catholic churches in the Philippines and killing at least twenty, wounding dozens. But this attacked happened in late January (not, as the post implies, in mid-March). And, the tragedy was covered by media when it actually happened, including CNN, Fox, NYTimes, BBC, Reuters and many more. The killings in Nigeria are different, more complicated. The posts that have been circulating, often referencing a Breitbart headline, claim that Muslim militants have killed more than 120 Christians in Nigeria. Again, this is a mixture of truth and error. The numbers vary from agency to agency, but 120 is very likely. However, this is part of a larger feud between farmers and herders that is raging in Nigeria currently. Muslim nomadic herders (Fulani) have been in conflict with the ethnically Christian Adara people in Nigeria. Many on both sides have been killed. In February, Adara gunmen, in response to an attack by Fulani, targetted Fulani settlements and killed at least 130. In March, yes 120 Christians, or more, were killed as a part of this conflict. It's ugly. It is war. Which makes it categorically different than a white supremacist walking into a mosque and killing fifty, wounding more. The Christland shooting has received more attention than either of the other two events. I don't doubt that, but it seems completely understandable too. There is a 'first world bias' to events we read about or hear about from the media. A factory fire that kills 20 in Bangladesh won't make the news. Same fire in Chicago or Londo will. And, this kind of violence isn't expected in New Zealand, but we have become somewhat calloused to it in other parts of the country. A gangland shootout killing three or four people won't make the news if it's in Chicago or LA. If it's on the streets of Cape Cod or in Disneyland it would. Let me be blunt, misrepresenting these horrific events to make the point that Christians are ignored by the media is dishonest. It is, in terms of the Ten Commandments, bearing false witness. And, it dishonors the dead - they aren't tools to be used in your war against the media. Shaping public opinion by using false data is, at best, manipulative. It feeds the "us vs. them" mentality that is doing so much harm in our nation and across the globe. Please stop. This post isn't a political one, but I have noticed something over the past few years regarding how we talk about politics that I'd like to call out, partly because it's just incorrect, and partly because it has implications for how we read and understand the Scriptures. For a long time now I've seen social media posts that read, 'He's not my President' or 'He/she/they don't speak for me'. It's not just under the current administration that this kind of rhetoric has been common - many conservative/right wingers said the same kind of thing under the previous administration. Well, hate to break it to you, but they do - whether you like it or not. Again, this isn't a post in support of any politician or party, court decision or policy. I don't post political things (usually), and I'm not doing so here. It's just a post about reality. The U.S. is a representative democracy - we elect representatives who represent us. They speak for us, enact laws on our behalf, appoint judges, make decisions, strike treaties, etc. I have never done any of those things, but my representatives have on my behalf. I don't always like their decisions, but they do speak for me. If Congress declares war on Canada [or the President; War Powers Resolution is iffy constitutionally], then we, including me, are at war. It is a special expression of our western individualism [run amuck] that says things like 'PersonX doesn't speak for me' when PersonX clearly does. And this individualism makes it hard to accept a key principle of Scripture - federal headship. Did I appoint Adam as my representative? No, I didn't have a say. Do I approve of what he did? No (but, slightly off point, I would have failed just as miserably - I do it daily). But still Adam spoke and acted as my representative. He declared independence from his Maker, thrust himself and me into conflict with the Divine Judge/Jury/Executioner. "But he doesn't speak for me!" Yes, yes he does. And so does Christ. He speaks for me and all those who are 'in him'. He, as the second Adam, is our faithful and true representative who makes terms of peace for us, accomplishes the peace, and imposes a new law of love. At the same time, I am conscripted by him into an ongoing war against darkness, sin, and the devil. Our western, individualistic presuppositions can truly make it difficult to understand texts written in the Ancient Near East, and to the degree that such presuppositions are fallen and twisted, they make it hard to understand how a holy God operates too. Yesterday I posted some thoughts related to God's wisdom as it is revealed in the story of Joseph. I kept thinking about it last night and into this morning, and am all the more in awe of God's wisdom. In essence, I came to the the conclusion yesterday that if Joseph hadn't been sold into slavery, we're all going to hell. How did I come to this fairly startling conclusion? Joseph being sold into slavery, though a series of convoluted machinations, places Joseph in a place of tremendous influence in Egypt, second only to Pharaoh. In this role, Joseph institutes a plan that will save thousands of lives during a seven year famine that God warns of in a dream. Among those lives saved are Jacob (Joseph's elderly father) and Joseph's brothers. These men represent the covenant community, the descendants of Abraham and Jacob that will become Israel. If this small group of sojourners die of starvation (and they would have had Joseph not provided them grain), God's promise that Abraham's descendants would be numerous would fail. And, God's promise that Abraham's seed would be a blessing to the nations would fail too. If they die, there is no Israel; no Israel means no Messiah to bless the nations; no Messiah means we're still in our sin. That was my thought line yesterday. Then I started to question it and said to myself, "Surely, God would have found another way!" But that's not right. That God is all wise means God never has to go to Plan B. He chooses the right plan - the right goal and the right means to achieve it - from the outset. And because God is good and holy, we can be sure Plan A is a good and holy plan - a perfect goal and just means to accomplish it. Because God is all knowing, no unforeseen circumstances will arise and force him back to the drawing board. Because God is Almighty, no force can stand in his way when his plan has been determined. Saying God is Wise means no Plan B is needed! This morning I am studying the story of Joseph, getting ready to speak on God's wisdom for the men's group. It's such a familiar story, it's all the more striking when some new insight hits you. And that's what happened this morning. Joseph is sold into slavery by his jealous brothers. He endures life as a slave, mistreatment by Potiphar and his wife, incarceration and more. He's been betrayed and forgotten. But God is wise. Eventually, due to some disturbing dreams Pharaoh has (dreams play a huge role in Joseph's story), Joseph ends up in the court of Pharaoh in a incredibly influential position. Pharaoh's dream warned of a long famine that would follow on the heels of years of prosperity. In wisdom, Joseph helps Pharaoh make ready for the years of famine by storing up grain during the years of plenty. In so doing, he is instrumental in saving the lives of countless thousands of people. And here's where the story gets fantastic. Some of the people he saves are his own family - his scheming, treacherous brothers and his aging father. His wisdom rescues them from starvation. That, in and of itself, makes the story really cool. But consider that Jacob (Joseph's father) and his brothers are the descendants of Abraham and Isaac. They are the covenant community. They are the people that become the nation of Israel. They are the forefathers of the Messiah. If Joseph isn't sold into slavery, he doesn't find himself in Pharaoh's court preparing Egypt for famine. If Joseph isn't sold into slavery, Jacob and his brothers die of starvation. If Joseph isn't sold into slavery, there is no Israel. If Joseph isn't sold into slavery, Jesus isn't born in Bethlehem as Messiah. If Joseph isn't sold into slavery, we aren't saved by Jesus from our sins. If Joseph isn't sold into slavery, I am going to hell for eternity. This morning I will be sharing with the Mom's group at ECC on the topic of family Bible reading. Our family has certainly had it's ups and downs, its trials and errors, and its successes. There have been, shamefully, periods where we've gone months without consistent Bible reading together. And, there's been other periods, more regular and more sustained, when we've read the Bible together faithfully. During all of it, there are a few things we've tried to keep balanced. We certainly want to be regular in our ingestion of God's Word together as a family. But we've not been legalistic about it either. If we miss a night or two, we don't stress about it. Last night we went to my nieces last IU game at home - it was senior night. It was awesome and went into double overtime, ending in an IU win (Karlee played extremely well). We didn't get home late and kids were tired, Caleb still had homework to do, etc. So, we didn't do devotions last night. Doing so would have been overly burdensome. Insisting we do so would have been legalistic. Now we have taken, at times, this libertarian approach too far and fallen out of a real habit. That's worse. But you and your family need to find the right balance. Growing up I knew all the little stories of the Bible. When we played Bible Trivia (and we did often), I was pretty good. Christian school, Sunday school, my parents, my dad's sermons, etc., all taught the stories of Bible. But it wasn't till much later that I could put these together in a comprehensive way - in a way that reflected an understanding of the Big Story of the Bible. I think that trend has been reversed in my kids. They know the Grand Story...I've told it over and over again. Our church emphasizes it. We've read devotionals that teach it. But, I'm not sure they know the stories like Gideon, Ehud, the story of the rich man and Lazarus, etc. Both are important. In fact, the Big Story is hard to tell without certain of the small stories. And the point of the small stories is easy to miss if you can't put them in the context of the Big Story. So find the right balance. Note: using the word story with your kids...we emphasized that the Bible stories are true stories, not stories like Hansel and Gretel or Dr. Seuss. The Bible stories teach moral lessons. David was a courageous young man. Daniel stood up for what was right. Ruth was loyal. Amen. Our kids need to hear these moral lessons and need to have good exemplars of the faith to model. And, there's biblical precedent for this - simply look at Hebrews 11 where Abraham et al are held up as models of faith leading to action. But these stories aren't about moral lessons; in fact, Moses, Daniel, David, etc. - they're not the heroes of the stories. God is! At one point when we were teaching through the stories of the OT, we had a little ritual. I'd tell the story, make my wise, fatherly/pastoral comments, and then end with a question, "What's the point of the story?" The kid's response was "God saves his people!" Teach the morals, but never lose sight of the real point of the stories! Is it ok to use a kids Bible, or a Bible story book that paraphrases the stories, or must we read straight from the Bible? I think both are good. And I think, again, both have Biblical precedent. When the Israelites crossed the Jordan they erected altars. They were told to so, so that when they passed by later with their children and the children's asked, "what are these? ", they'd have the opportunity to tell them the story of God's deliverance. Not read it or recite it, tell it. But certainly, we're commanded not only to read Scripture but hide it our hearts. Reading the word of God as God inspired it is incredibly important. I remember passages that I never memorized, but I've heard read over and over again. That is so important. So tell the stories and read the Word. Do both. It's hard, especially with several kids, to find the right balance here. What's appropriate for one is very challenging for another (or overly simplistic). We probably lean towards the challenging. Sometimes the youngest may feel it's over his head. But, I've seen a few things happen repeatedly. One they ask questions, and conversations start that are priceless. Two, the older kids take on the role of tutor, and explain it in more simple terms. That's awesome! Three, the younger kids understand way more that I think they do. Four, months later, they'll recall something we discussed. They didn't get it at the time, but now the light bulb went on. Love it! So we tend to the challenging, maybe not always age appropriate. But if that's all we did, it probably wouldn't work. Sometimes the conversations are more simple...and the older ones know it's not always all about them. Plus, who of us doesn't need to be reminded and dwell on the simple lessons from time to time? We don't have all this figured out. We did. Then we had kids. My encouragement to you is to struggle through it. Find the time, make the mistakes, do your best. Find the appropriate balance in these areas and pour into your kids, showing them that the content of our faith really matters. scary mary poppins. too funny! Do evangelicals take the Bible literally? What is the meaning of 'homosexual' in the Bible? My wife and I celebrated our twentieth anniversary this past fall. I am father to three great boys. 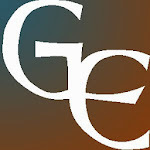 I serve as the pastor of adult ministries at Evangelical Community Church in Bloomington, Indiana (though the views expressed on this blog are not necessarily those of the of the church or its leadership as a whole). I consider myself evangelical in the historic sense of the word. I prefer the term Confessional, though the irony is I don't minister at a confessional church. I'm reformed, with sympathies for high church and sacramental Christianity. I like the warmth of Edwards, the ecclesiology of Nevin and two kingdom theology of Machen, and everything about Calvin (with the possible exception of his handling of the Servetus trial). Copyright, Dan Waugh. Powered by Blogger.